Swan Lake, part of the Mariinsky at BAM, comes to the BAM Howard Gilman Opera House from Jan 15—23. Context is everything, so get even closer to the show with this curated selection of articles, interviews, and videos related to the production. Once you've seen it, help us keep the conversation going by telling us what you thought below. 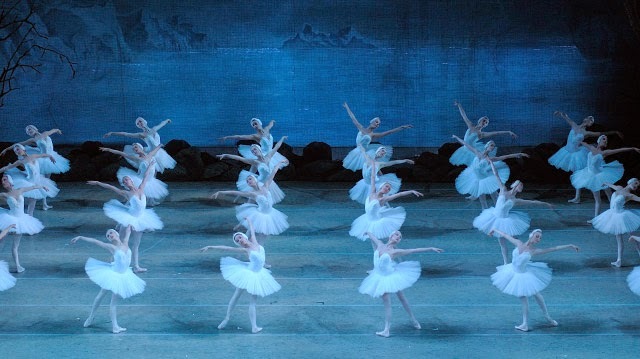 Susan Yung on what separates the famous St. Petersburg ballet from the rest. Of all the ballets in the classical canon, what makes Swan Lake so timeless, and so worthy of revisiting? Mariinsky Ballerinas talk about starring in Swan Lake. Tereshkina, who performs in Swan Lake on January 15, was only seven when she first saw Tchaikovsky's famous ballet. The Mariinsky principle discusses the controversial "6 o'clock extension," being a mother, and more. The Mariinsky’s Yekaterina Kondaurova, who dances Odette/Odile on January 16, on her favorite ballet roles. Learn more about the Mariinsky dancer performing Odette/Odile on January 22. Take a virtual tour of the famous concert hall, read about the theater's history, and more. Read about the the Mariinsky Theatre's USA tour on their blog. Watch a timelapse of the BAM stage crew unloading and building the sets for the Mariinsky residency. Tchaikovsky's ballet has had its share of innovative interpreters. Dancer Viktoria Tereshkina shows off her dressing room while Sarah Crompton explores where the backdrops are painted. Backlit Onyx interiors, 10 floors, and a perfect view from every seat: explore the Mariinsky's $750-million new home. The Mariinsky principle turned down his first invitation to join the famous ballet. Sergeyev, who was the first choreographer to stage the Mariinsky's current version of Swan Lake in 1950, performs with Natalia Dudinskaya. Sample excerpts from The Enchanted Wanderer, Swan Lake, Cinderella, works by Shostakovich, and more in this playlist featuring the Mariinsky Orchestra and Opera. Seeing Ulyana Lopatkina dance the swan was such a transcendent experience. I've seen her dance on film/tape many times, but watcing her live you could feel you were in the presence of a consummate artist. Thank you, Mariinsky & BAM, for that experience. I am so glad that I was able to see Galina Ulanova's Swan Lake. I knew her Odette would be phenomenal, but WOW! her Odile. The minute she made her entrance, my adrenaline shot up. Her facial expressions (those eyes) her makeup even those red earrings all served to complete her transformation. Red was a leit motif for Rothbart/evil. How about those red eyes of his, they broadcast his black heart to the top of the balcony. The orchestra’s playing; the costumes and Tchaikovsky’s music were a treat. Words cannot describe Ulanova’s Odette. You just have to experience it for yourself. That said I do wish the Mariinsky would film her Swan Lake. At least I have my memory, lucky me. Sorry, I must have been transported to another world by Ulyana Lopatkina's Swan Lake. Yeah, there is a video, in both blue-ray and standard DVD. A truly remarkable experience. I have the Blu-ray of this production, but nothing compares to live. Saw Oxana Skorik. She had to be as great as the best of them. Sort of can't understand why she's a 2nd string soloist at Mariinsky. I'm sort of astounded that the company was able to adapt to the foreshortened stage dimensions of the BAM stage. This old theater was not built to provide the space common in most opera houses like the Mariinsky. It's obvious on the Blu-ray, their home stage is much deeper. I can't imagine how much adjusting had to be made in the choreography and still bring it off. Kudos. Now, just a comment on two reviews on these performances, the NYT and NPR. I'm a little tired of reading reviews knocking longstanding dance, music and theatrical traditions that survive from the time of their creation to be performed over a century later. There is a reason they survive. They are purely gorgeous to behold. One reviewer in the NPR piece was quoted as saying she and her friends were bored to tears by a performance of this ballet (not Mariinsky) because re-staging the tired old masterpieces do nothing for modern audiences, who need temporally apt, socially enlightening re-vampings (or perhaps even "contempo-schtuck" - author) to make the stuff worthwhile to watch. You don't go to Swan Lake for an education, or for new jokes. You go to experience one of the great sights and sounds available in the world today. New "visions" of traditional works by oh-so-clever modern directors have destroyed the aesthetic experience for many an opera and dance production. There have been exceptions to this, of course, but leave Swan Lake alone, especially this one. My heart is broken that this year's Meistersinger at the Met will be the last for this spectacular presentation and will be replaced in 6 years by some new-fangled thing from Salzburg. European directors are especially egregious in this regard. I hope the new production won't be just another example of Euro-trash. Well, enough ranting. BRAVI Mariinsky! My very first ballet and it was amazing! I saw the production on 1/21. I barely have words to describe it. I teared up at points because it was so overwhelming. Simply breathtaking! Thank you Mariinsky and BAM! I saw the production on 1/21 and was disappointed. Act 1 was breathtaking, until Yekaterina Kondaurova came out; she seemed so low energy and not really wanting to be there. In Act 2 the costumes were amazing, however Yekaterina Kondaurova slipped out from Timur Askerov's arms during Odile/ Prince Siegfried's dance and then during solo dances both prince and his friend slipped. Act 3 seemed so rushed. And then I was truly shocked at the final bow as only Yekaterina Kondaurova/Timur Askerov, Von Rothbart, the conductor and all the swan's remained. Where were all the other cast members? At least the main ones should have been there, like the prince's friend, the Mother and the tutor.... that was extremely rude that those performers have already gone home(in fact I saw the 'tutor' leave at the back door as I was there after Act 2 to drip off flowers). This Wednesday night performance was treated as 'less speacial' as the opening night performance, for example. Like everyone, I have seen Swan Lake many times, but last night's program will be how I remember it when I picture it in my mind. It was grand. This was the only performance of the Mariinsky Ballet's residency at BAM that I was able to attend, and I hesitated because, well, do I really need to see Swan Lake again? I am so glad I followed my instincts and bought a ticket. They deserved every curtain call and more.